Charles Jennens. Messiah. An oratorio. London, 1749? Folger Shakespeare Library. On April 13, 1742, a new oratorio by the famous composer George Frideric Handel made its debut in Dublin, Ireland. The performance was held to benefit three local charities: prisoners’ debt relief, the Mercer’s Hospital, and the Charitable Infirmary. The Dublin News-Letter provided an early critique on the work, praising the oratorio as “…far surpass[ing] anything of that Nature which has been performed in this or any other Kingdom”. 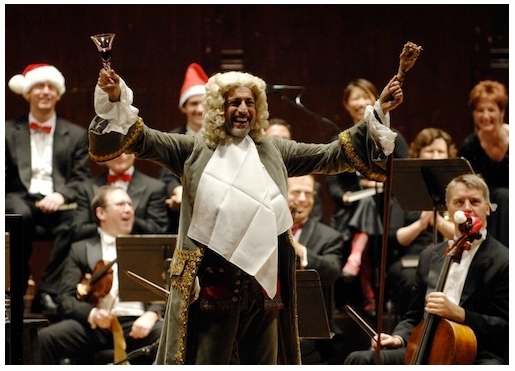 Handel’s Messiah has continued to be performed ever since. Its librettist, Charles Jennens, drew from the King James Bible for his text, with one exception: lines from the psalms are taken from Miles Coverdale’s earlier translations in the Book of Common Prayer. To hear excerpts from Messiah, with information on their KJB connections, please enjoy the Handel’s Messiah interactive feature on the Manifold Greatness website. More information on Handel himself appears in this previous post. Amy Arden assisted in the development and production of the Manifold Greatness website. She is a communications associate at the Folger Shakespeare Library. Tafelmusik Baroque Orchestra and Chamber Choir, Toronto, Canada. Photo by Gary Beechey. Composer George Frideric Handel was born today in 1685. Famous for the “Hallelujah Chorus” and Messiah, Handel nevertheless had a prolific career as a opera composer and drew on a wide range of musical influences from German, French, Italian, and English traditions. In addition to his distinguished musical career, which included 42 operas, as well as many shorter compositions and oratorios, Handel actively supported various charitable institutions. In fact, the first performance of Messiah was held to benefit individuals imprisoned for debt and hospitals. On April 13, 1742, concertgoers crowded into the Great Music Hall on Fishamble Street in Dublin; to accommodate the largest audience possible, gentlemen were asked not to wear swords, and ladies were discouraged from wearing hoops in their dresses. The performance earned rave reviews, and a second concert was given in Dublin in June. When Messiah made its London premiere on March 23 1743, responses were less than enthusiastic. Some felt that the venue, Covent Garden, did not suit the sacred nature of the music. Almost the entirety of the libretto is drawn from the text of the King James Bible; the sole exception is the Psalms, which are based on Miles Coverdale’s translation. Messiah eventually became a standard part of London’s musical repertoire; in fact, Handel attended a performance on April 6 1759, just days before he died. To hear excerpts from Messiah and learn more about its connections to the King James Bible, please visit the Handel’s Messiah interactive feature on the Manifold Greatness website. 1. George Frideric Handel was made a British citizen by an Act of Parliament. 2. He gave several benefit concerts in support of London’s Foundling Hospital, which provided care for abandoned and unwanted children. The hospital, now the Founding Museum, holds a large collection of Handel memorabilia. 3. Handel’s father discouraged his son’s interest in music and wanted Handel to be a lawyer instead; according to one biographer, Handel hid a clavichord in an upstairs room and practiced in secret. 4. Although Messiah is now associated with the Christmas season, it was originally performed during Lent. 5. George Frideric Handel has a feast day on the liturgical calendar of the Episcopal Church in the United States. 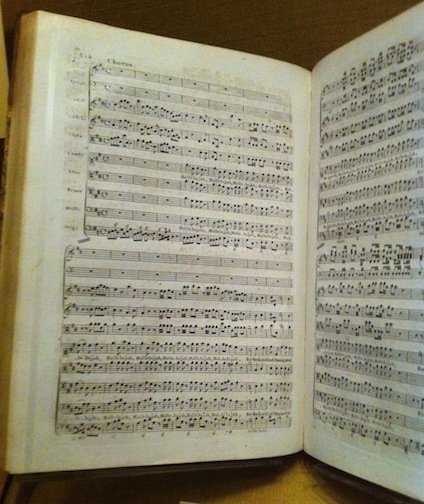 On display in the Folger Manifold Greatness exhibition: Messiah. ca. 1807. Folger. It always strikes me around this time of year, when our thoughts turn toward Messiah, that if things had turned out differently Georg Frideric Handel might never have invented the English oratorio. Most of us are familiar with the form through Messiah, which received its first performance in Dublin in 1742, and has been wildly popular practically ever since. In fact, since its first London performances it has been performed every year and unlike so much music from the first half of the eighteenth century it has never fallen out of favor with audiences. 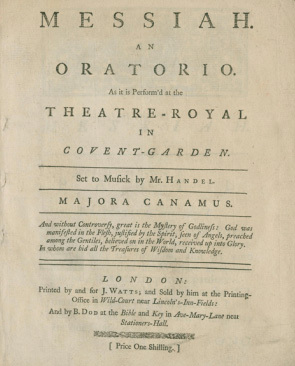 But back to the chain of events which led Handel, a German living in London who loved Italian opera above all else, to invent the English oratorio, and hence to write this most beloved of works. Starting with fifteen wildly popular performances of Rinaldo in 1711, he had great success with opera. But Handel’s three decade run in London as a successful opera producer and composer ended in 1737. It really wasn’t his fault—his operas continued to be sung by famous singers and the tunes were just as appealing as ever. But by the 1730s he had rivals, all competing for the shrinking number of Londoners who were still inclined to attend long Italian operas. Audiences were becoming dissatisfied with pieces featuring implausible plots sung entirely in an incomprehensible language. Messiah word book. London, 1749(? ), Folger. Yet Handel still yearned to compose theatrical music. As early as 1713 he was in the habit of playing on the organ at St. Paul’s Cathedral and then crossing the street to the Queen’s Arms Tavern to indulge his legendary appetite for, well, extra-musical refreshments. Some of his Cathedral companions there no doubt assisted the German opera composer in acquiring a thorough knowledge of the English choral tradition, especially the music of Henry Purcell. He used this knowledge in the creation of his only truly original musical form, the English oratorio. Although the oratorios were never staged, the musical style and dramatic sweep of the recitatives and arias are straight from the opera tradition. Handel’s use of English and choruses made the form unique. The struggles of the Old Testament heroes and fates of their people portrayed in their librettos, or ‘word books,’ found a national resonance with the subjects of George I. Prosperous Londoners, at the center of their vast empire, really did identify with the chosen people of the Bible. 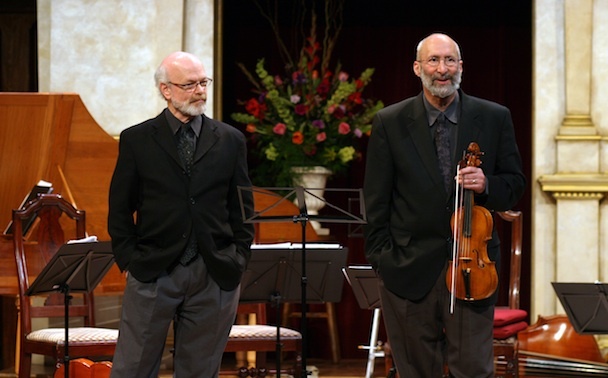 Christopher Kendall and Robert Eisenstein, artistic directors of the Folger Consort. Photo: Mig Dooley. As a gift to the public in conjunction with the Folger Manifold Greatness exhibition, the Folger Shakespeare Library and the Folger Consort present a free download of six selections from a live audio recording of Handel’s Messiah from performances by Folger Consort and the Choir of Magdalen College, Oxford. Robert Eisenstein is, with Christopher Kendall, one of two artistic directors of the Folger Consort, the resident early music ensemble of the Folger Shakespeare Library. We were saddened to learn of the death of recording engineer Curt Wittig, who contributed in a very significant way to the Handel’s Messiah portion of our Manifold Greatness website. Composer James Primosch has this tribute on his blog, with additional links. 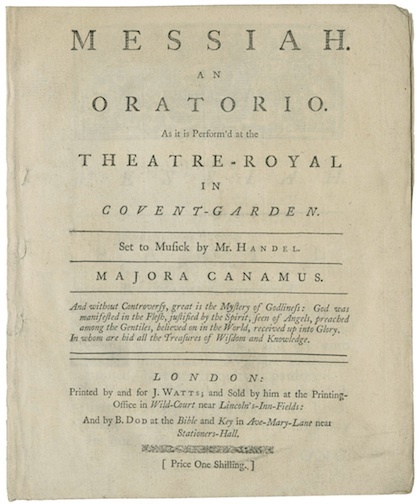 Soon after starting work on the Manifold Greatness website, we discovered that Handel’s Messiah—which, as we have previously noted, takes most of its text from the King James Bible—had been performed in 1991 by the Choir of Oxford’s Magdalen College and the Folger Consort, the resident early music ensemble of the Folger Shakespeare Library. The 1991 Folger-Oxford performance was a nice parallel to Manifold Greatness, a joint project of the Folger Shakespeare Library and the Bodleian Library of the University of Oxford, with assistance from the Harry Ransom Center of the University of Texas. 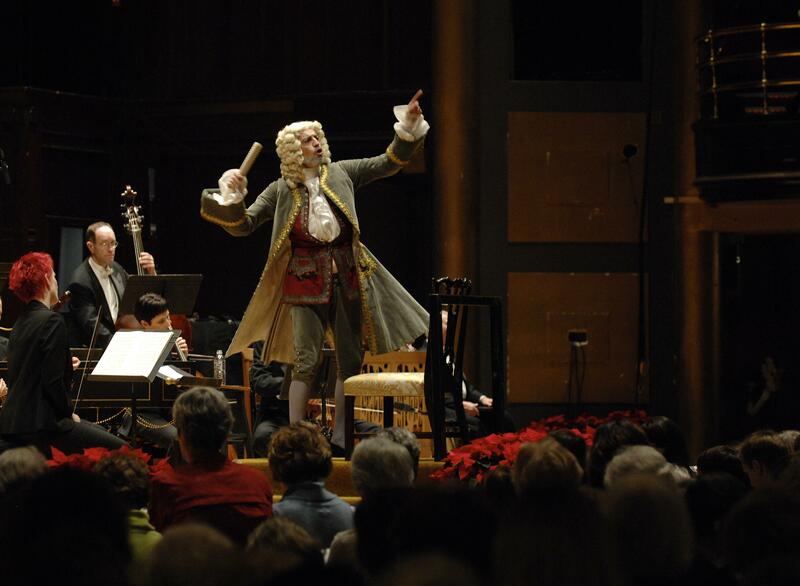 Recordings of the three 1991 performances were thus a natural source for audio clips to be included in the Handel’s Messiah portion of the website. Archival recordings of multiple concerts in a public space cannot simply be used as-is, however. Curt, the long-standing audio engineer for the Folger Consort, came to the rescue. Having made the original recordings of the 1991 concerts, he worked closely with us last year to edit clips from the multiple performances, while also suggesting the best segments of the work to use from an audio perspective. His meticulous and thoughtful edits now make it possible for website visitors to hear how Handel and his librettist Charles Jennens set the words of the King James Bible to music, producing a work that has become so widely performed that it may well be the primary way in which many people hear the language of the King James Bible today. You can hear Curt’s audio excerpts from the Messiah here. Messiah, by Tafelmusik, Toronto. Photo by Gary Beechey. On April 13, 1742, a new oratorio by the famous composer George Frideric Handel debuted in a music hall in Dublin, Ireland. Handel’s Messiah has continued to be performed ever since, a perennially popular work that offers many concertgoers their most regular, and likely their most full-throated, exposure to the text of the King James Bible. Its librettist, Charles Jennens, assembled most of the words from the KJB, with one exception: lines from the psalms are taken from Miles Coverdale’s earlier translations in the Book of Common Prayer. In celebration of April 13, we’ve assembled a new “Handel and the KJB” Flickr slideshow that combines a rare early surviving “word book” of Handel’s Messiah from the Folger Shakespeare Library with a look at modern sing-along holiday performances of the work, a tradition in many churches and communities. To hear excerpts from Messiah, with information on their KJB connections, please enjoy the Handel’s Messiah interactive feature on our brand-new Manifold Greatness website. And yes, the premiere really was April 13. We even found this marker!